This article is about the modern city. For the historical prefecture, see Hang Prefecture. Not to be confused with Changzhou, Cangzhou, or Yangzhou. Hangzhou (Mandarin: [xǎŋ.ʈʂóu] ( listen); local dialect: /ɦɑŋ tseɪ/) formerly romanized as Hangchow, is the capital and most populous city of Zhejiang Province in East China. It sits at the head of Hangzhou Bay, which separates Shanghai and Ningbo. Hangzhou grew to prominence as the southern terminus of the Grand Canal and has been one of the most renowned and prosperous cities in China for much of the last millennium. The city's West Lake, a UNESCO World Heritage site immediately west of the city, is among its best-known attractions. A study conducted by PwC and China Development Research Foundation saw Hangzhou ranked first among "Chinese Cities of Opportunity". Hangzhou is also considered a World City with a "Beta+" classification according to GaWC. Hangzhou is classified as a sub-provincial city and forms the core of the Hangzhou metropolitan area, the fourth-largest in China. During the 2010 Chinese census, the metropolitan area held 21.102 million people over an area of 34,585 km2 (13,353 sq mi). Hangzhou prefecture had a registered population of 9,018,000 in 2015. In September 2015, Hangzhou was awarded the 2022 Asian Games. It will be the third city in China to host the Asian Games after Beijing 1990 and Guangzhou 2010. Hangzhou, an emerging technology hub and home to the e-commerce giant Alibaba, also hosted the eleventh G20 summit in 2016. The celebrated neolithic culture of Hemudu is known to have inhabited Yuyao, 100 km (62 mi) north-east of Hangzhou, as far back as seven thousand years ago. It was during this time that rice was first cultivated in southeast China. Excavations have established that the jade-carving Liangzhu culture (named for its type site just northwest of Hangzhou) inhabited the area immediately around the present city around five thousand years ago. The first of Hangzhou's present neighborhoods to appear in written records was Yuhang, which probably preserves an old Baiyue name. Hangzhou was made the seat of the prefecture of Hang in AD 589, entitling it to a city wall which was constructed two years later. By a longstanding convention also seen in other cities like Guangzhou and Fuzhou, the city took on the name of the area it administered and became known as Hangzhou. Hangzhou was at the southern end of China's Grand Canal which extends to Beijing. The canal evolved over centuries but reached its full length by 609. In the Tang dynasty, Bai Juyi was appointed governor of Hangzhou. Already an accomplished poet, his deeds at Hangzhou have led to his being praised as a great governor. He noticed that the farmland nearby depended on the water of West Lake, but due to the negligence of previous governors, the old dyke had collapsed, and the lake so dried out that the local farmers were suffering from severe drought. He ordered the construction of a stronger and taller dyke, with a dam to control the flow of water, thus providing water for irrigation and mitigating the drought problem. The livelihood of local people of Hangzhou improved over the following years. Bai Juyi used his leisure time to enjoy the West Lake, visiting it almost daily. He also ordered the construction of a causeway connecting Broken Bridge with Solitary Hill to allow walking, instead of requiring a boat. He then had willows and other trees planted along the dyke, making it a beautiful landmark. This causeway was later named "Bai Causeway", in his honor. It is listed as one of the Seven Ancient Capitals of China. It was first the capital of the Wuyue Kingdom from 907 to 978 during the Five Dynasties and Ten Kingdoms period. Named Xifu (西府) at the time, it was one of the three great bastions of culture in southern China during the tenth century, along with Nanjing and Chengdu. Leaders of Wuyue were noted patrons of the arts, particularly of Buddhist temple architecture and artwork. The dyke built to protect the city by King Qian Liu gave the Qiantang its modern name. Hangzhou also became a cosmopolitan center, drawing scholars from throughout China and conducting diplomacy with neighboring Chinese states, and also with Japan, Goryeo, and the Khitan Liao dynasty. In 1089, while another renowned poet Su Shi (Su Dongpo) was the city's governor, he used 200,000 workers to construct a 2.8 km (1.7 mi) long causeway across West Lake. The lake was once a lagoon tens of thousands of years ago. Silt then blocked the way to the sea and the lake was formed. A drill in the lake-bed in 1975 found the sediment of the sea, which confirmed its origin. Artificial preservation prevented the lake from evolving into a marshland. The Su Causeway built by Su Shi, and the Bai Causeway built by Bai Juyi, a Tang dynasty poet who was once the governor of Hangzhou, were both built out of mud dredged from the lake bottom. The lake is surrounded by hills on the northern and western sides. The Baochu Pagoda sits on the Baoshi Hill to the north of the lake. Arab merchants lived in Hangzhou during the Song dynasty, due to the fact that the oceangoing trade passages took precedence over land trade during this time. There were also Arabic inscriptions from the 13th century and 14th century. During the later period of the Yuan dynasty, Muslims were persecuted through the banning of their traditions, and they participated in revolts against the Mongols. The Fenghuangshi mosque was constructed by an Egyptian trader who moved to Hangzhou. Ibn Battuta is known to have visited the city of Hangzhou in 1345; he noted its charm and described how the city sat on a beautiful lake and was surrounded by gentle green hills. During his stay at Hangzhou, he was particularly impressed by the large number of well-crafted and well-painted Chinese wooden ships with colored sails and silk awnings in the canals. He attended a banquet held by Qurtai, the Yuan Mongol administrator of the city, who according to Ibn Battuta, was fond of the skills of local Chinese conjurers. Hangzhou was chosen as the new capital of the Southern Song dynasty in 1132, when most of northern China had been conquered by the Jurchens in the Jin–Song wars. 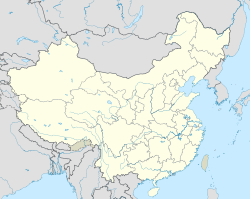 The surviving imperial family had retreated south from its original capital in Kaifeng after it was captured by the Jurchens in the Jingkang Incident of 1127. Emperor Gaozong moved to Nanjing, then to modern Shangqiu, then to Yangzhou in 1128, and finally to Hangzhou in 1129. The Song government intended it to be a temporary capital, but over the decades Hangzhou grew into a major commercial and cultural center of the Song dynasty, rising from being a middling city of no special importance to being one of the world's largest and most prosperous. Once the prospect of retaking northern China had diminished, government buildings in Hangzhou were extended and renovated to better befit its status as a permanent imperial capital. The imperial palace in Hangzhou, modest in size, was expanded in 1133 with new roofed alleyways, and in 1148 with an extension of the palace walls. From 1138 until the Mongol invasion of 1276, Hangzhou remained the capital of the Southern Song dynasty and was known as Lin'an (臨安). It served as the seat of the imperial government, a center of trade and entertainment, and the nexus of the main branches of the civil service. During that time the city was a gravitational center of Chinese civilization: what used to be considered "central China" in the north was taken by the Jin, an ethnic minority dynasty ruled by Jurchens. Numerous philosophers, politicians, and men of literature, including some of the most celebrated poets in Chinese history such as Su Shi, Lu You, and Xin Qiji came here to live and die. Hangzhou is also the birthplace and final resting place of the scientist Shen Kuo (1031–1095 AD), his tomb being located in the Yuhang district. During the Southern Song dynasty, commercial expansion, an influx of refugees from the conquered north, and the growth of the official and military establishments, led to a corresponding population increase and the city developed well outside its 9th-century ramparts. According to the Encyclopædia Britannica, Hangzhou had a population of over 2 million at that time, while historian Jacques Gernet has estimated that the population of Hangzhou numbered well over one million by 1276. (Official Chinese census figures from the year 1270 listed some 186,330 families in residence and probably failed to count non-residents and soldiers.) It is believed that Hangzhou was the largest city in the world from 1180 to 1315 and from 1348 to 1358. Because of the large population and densely crowded (often multi-story) wooden buildings, Hangzhou was particularly vulnerable to fires. Major conflagrations destroyed large sections of the city in 1132, 1137, 1208, 1229, 1237, and 1275 while smaller fires occurred nearly every year. The 1237 fire alone was recorded to have destroyed 30,000 dwellings. To combat this threat, the government established an elaborate system for fighting fires, erected watchtowers, devised a system of lantern and flag signals to identify the source of the flames and direct the response, and charged more than 3,000 soldiers with the task of putting out fire. Hangzhou was besieged and captured by the advancing Mongol armies of Kublai Khan in 1276, three years before the final collapse of the Southern Song. The capital of the new Yuan dynasty was established in the city of Dadu (Beijing), but Hangzhou remained an important commercial and administrative center for their southern lands. Yuan China was very open to foreign visitors, and several returned west describing Hangzhou—under the names Khinzai, Quinsai,[a] Campsay, &c.[b]—as one of the foremost cities in the world. The Venetian merchant Marco Polo supposedly visited Hangzhou in the late 13th century. In his book, he records that the city was "greater than any in the world" and that "the number and wealth of the merchants, and the amount of goods that passed through their hands, was so enormous that no man could form a just estimate thereof." The manuscripts of Polo's account greatly exaggerate the city's size, although it has been argued that the "hundred miles" of walls would be plausible if Chinese miles were intended instead of Italian ones and that the "12,000 stone bridges" might have been a copyist error born from the city's 12 gates. In the 14th century, the Moroccan traveler Ibn Battuta arrived; his later account concurred that al-Khansā was "the biggest city I have ever seen on the face of the earth." Jingdezhen Green-and-white-glazed Porcelain Statue of Goddess of Mercy. Yuan Dynasty. Unearthed near Wensan Street, Hangzhou in 1987. The city remained an important port until the middle of the Ming dynasty era, when its harbor slowly silted up. Under the Qing, it was the site of an imperial army garrison. In 1856 and 1860, the Taiping Heavenly Kingdom occupied Hangzhou. The city was heavily damaged during its conquest, occupation, and eventual reconquest by the Qing army. Hangzhou was ruled by the Republic of China government under the Kuomintang from 1927 to 1937 and 1945 to 1949. On May 3, 1949, the People's Liberation Army entered Hangzhou and the city came under Communist control. After Deng Xiaoping's reformist policies began in the end of 1978, Hangzhou took advantage of being situated in the Yangtze River Delta to bolster its development. It is now one of China's most prosperous major cities. Hangzhou is located in northwestern Zhejiang province, at the southern end of the Grand Canal of China, which runs to Beijing, in the south-central portion of the Yangtze River Delta. Its administrative area (sub-provincial city) extends west to the mountainous parts of Anhui province, and east to the coastal plain near Hangzhou Bay. The city center is built around the eastern and northern sides of the West Lake, just north of the Qiantang River. Hangzhou's climate is humid subtropical (Köppen Cfa) with four distinctive seasons, characterised by long, very hot, humid summers and chilly, cloudy and drier winters (with occasional snow). The mean annual temperature is 17.0 °C (62.6 °F), with monthly daily averages ranging from 4.6 °C (40.3 °F) in January to 28.9 °C (84.0 °F) in July. The city receives an average annual rainfall of 1,438.0 mm (56.6 in) and is affected by the plum rains of the Asian monsoon in June. In late summer (August to September), Hangzhou suffers typhoon storms, but typhoons seldom strike it directly. Generally they make landfall along the southern coast of Zhejiang, and affect the area with strong winds and stormy rains. Extremes since 1951 have ranged from −9.6 °C (15 °F) on 6 February 1969 up to 41.6 °C (107 °F) on 9 August 2013; unofficial readings have reached −10.5 °C (13 °F), set on 29 December 1912 and 24 January 1916, up to 42.1 °C (108 °F), set on 10 August 1930. With monthly percent possible sunshine ranging from 30% in March to 51% in August, the city receives 1,709.4 hours of sunshine annually. The sub-provincial city of Hangzhou comprises 10 districts, 1 county-level city, and 2 counties. The ten urban districts occupy 8,292.31 km2 (3,201.68 sq mi) and have a population of 8,241,000, in which there are six central urban districts and four suburban distrcits. The central urban districts occupy 706.27 km2 (272.69 sq mi) and have a population of 3,780,000 and the suburban distrcits occupy 7,586.04 km2 (2,928.99 sq mi) and have a population of 4,461,000. In the early 90s, the urban districts of Hangzhou only comprises Shangcheng, Xiacheng, Gongshu, Jianggan. On December 12, 1996, Bingjiang District was established. On March 12, the City of Xiaoshan and the City of Yuhang was included into the City of Hangzhou as two districts. On December 13, 2014, and in July 2017, the City of Fuyang and Lin'an were included into the City of Hanghzou as two districts. Hangzhou city had a population of 5,162,039 (including Xiaoshan and Yuhang) at the 2010 census, an increase of 4.8% per year since the 2000 census. The most recent estimates of the city's urban area population are between 6,658,000 and 6,820,000. The entire province had a population of 8,700,373 at the 2010 census, and the encompassing urban agglomeration (including Shaoxing) is estimated to have population of 8,450,000. The encompassing metropolitan area was estimated by the OECD (Organisation for Economic Co-operation and Development) to have, as of 2010[update], a population of 13.4 million, although other sources put the figure at over 21 million. The Hangzhou metropolitan area includes the major cities of Shaoxing, Jiaxing and Huzhou. Hangzhou's economy has rapidly developed since its opening up in 1992. It is an industrial city with many diverse sectors such as light industry, agriculture, and textiles. It is considered an important manufacturing base and logistics hub for coastal China. In recent years, Hangzhou has seen substantial development in its financial sector, featuring for the first time in the Global Financial Centres Index in 2018 at rank 89. 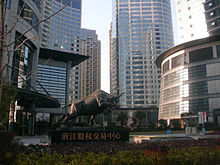 The 2001 GDP of Hangzhou was RMB 156.8 billion, which ranked second among all of the provincial capitals after Guangzhou. The city has more than tripled its GDP since then, increasing from RMB 156.8 billion in 2001 to RMB 1.3509 trillion in 2018 and GDP per capita increasing from US$3,020 to $21,184. The city has developed many new industries, including medicine, information technology, heavy equipment, automotive components, household electrical appliances, electronics, telecommunication, fine chemicals, chemical fibre and food processing. Hangzhou Economic & Technological Development Zone was established and approved as a national development zone by the State Council in 1993. It covers an area of 104.7 km2 (40.4 sq mi). Encouraged industries include electronic information, biological medicine, machinery and household appliances manufacturing, and food processing. Hangzhou Export Processing Zone was established on April 27, 2000 upon approval of the State Council. It was one of the first zones and the only one in Zhejiang Province to be approved by the government. Its total planned area is 2.92 km2 (1.13 sq mi). It is located close to Hangzhou Xiaoshan International Airport and Hangzhou Port. Hangzhou Hi-Tech Industrial Development Zone was set up with approval from the State Council as a state level Hi-tech Industrial Development Zone in March 1991. The HHTZ is composed of three parts, with the main regions being the Zhijiang Sci-Tech Industrial Park and Xiasha Sci-Tech Industrial Park. HHTZ has become one of the most influential hi-tech innovation and hi-tech industry bases in Zhejiang Province. As of 2013[update], HHTZ hosts more than 1,100 software developers and BPO enterprises. Major companies such as Motorola, Nokia and Siemens have established R&D centers in the zone. In 2011, the GDP of the zone rose by 13.1 percent, amounting to RMB 41.63 billion. This accounted for 5.9 percent of Hangzhou's total GDP. The HHTZ positions itself as the "Silicon Valley" of China. The Alibaba Group, the world's largest online B2B portal and China's largest website in terms of market value, is headquartered in the zone. In 2016, G20 Summit was held in Hangzhou. Hangzhou is known for its historic relics and natural environment. Although Hangzhou has been through many recent urban developments, it still retains its historical and cultural heritage. Today, tourism remains an important factor for Hangzhou's economy. One of Hangzhou's most popular sights is West Lake, a UNESCO World Heritage Site. The West Lake Cultural Landscape covers an area of 3,323 ha (8,210 acres) and includes some of Hangzhou's most notable historic and scenic places. Adjacent to the lake is an area which includes historical pagodas, cultural sites, as well as the natural environment of the lake and hills, including Phoenix Mountain. There are two causeways across the lake. Grand Canal, also a UNESCO World Heritage Site. The part of the Canal in Hangzhou was built in 610 AD. To visit the core historical sites, you may take metro Line 5 and get off at Grand Canal Station (大运河站) or Gongchenqiao East Station (拱宸桥东站). The world's largest tidal bore races up the Qiantang River through Hangzhou reaching up to 12 m (39 ft) in height. The residence of Hu Xueyan (胡雪岩故居) located on Yuanbao Street was built in 1872 by Hu Xueyan, a native of Anhui, a very successful businessman. It was restored and opened to the public in 2001. Xixi National Wetland Park. Established with the aim of preserving the wetland ecological system, it covers an area of about 10 km2 (4 sq mi). Fish ponds and reed beds have been restored and it is home to many types of birds. It holds a temple and several historic rural houses. Old China Street on He Fang Street (He Fang Jie or Qing He Fang，literally 'neighbourhood along the river'), which offers various souvenirs. Yuefei Temple A temple constructed during the Song Dynasty in 1221 to commemorate Yue Fei, which is located near the West Lake. West Lake Cultural Square is one of the tallest buildings in the city centre (about 160 m (520 ft)) and houses the Zhejiang Natural History Museum and Zhejiang Museum of Science and Technology. Qiandao Lake is a man-made lake with the largest number of islands in Chun'an County, an administrative area of Hangzhou government. These islands are different in size and shape, and have distinctive scene. Longjing tea fields, west of the lake. In March 2013 the Hangzhou Tourism Commission started an online campaign via Facebook, the 'Modern Marco Polo' campaign. Over the next year nearly 26,000 participants applied from around the globe, in the hopes of becoming Hangzhou's first foreign tourism ambassador. In a press conference in Hangzhou on 20 May 2014, Liam Bates was announced as the successful winner and won a €40,000 contract, being the first foreigner ever to be appointed by China's government in such an official role. Jingci Temple is located just south of West Lake. Lingyin Temple (Soul's Retreat) is located about 2 km (1.2 mi) west of West Lake. This is believed to be the oldest Buddhist temple in the city, which has gone through numerous destruction and reconstruction cycles. Yue-Wang Temple (King Yue's Temple) or Yue Fei Miao is on the northwest shore of West Lake. It was originally constructed in 1221 in memory of General Yue Fei, who lost his life due to political persecution. Leifeng Pagoda, located on Sunset Hill south of West Lake. The Immaculate Conception Cathedral of Hangzhou is one of the oldest Catholic churches in China, dating back 400 years to the Ming dynasty. Fenghuang Mosque (凤凰清真寺) is one of the oldest mosques in China, the current construction at the intersection of Xihu Avenue (西湖大道) and the Central Zhongshan Road (中山中路) dates back 700 years to the Yuan dynasty. In 1848, during the Qing dynasty, Hangzhou was described as the "stronghold" of Islam in China, the city containing several mosques with Arabic inscriptions. A Hui from Ningbo also told an Englishman that Hangzhou was the "stronghold" of Islam in Zhejiang province, containing multiple mosques, compared to his small congregation of around 30 families in Ningbo for his mosque. Within the city of Hangzhou are two notable mosques: the Great Mosque of Hangzhou and the Phoenix Mosque. There was formerly a Jewish synagogue in Ningbo, as well as one in Hangzhou, but no traces of them are now discoverable, and the only Jews known to exist in China were in Kaifeng. Two of the Three Pillars of Chinese Catholicism were from Hangzhou. There was persecution of Christians in the early 21st century in the city. The native residents of Hangzhou, like those of Zhejiang and southern Jiangsu, speak Hangzhou dialect, which is a Wu dialect. 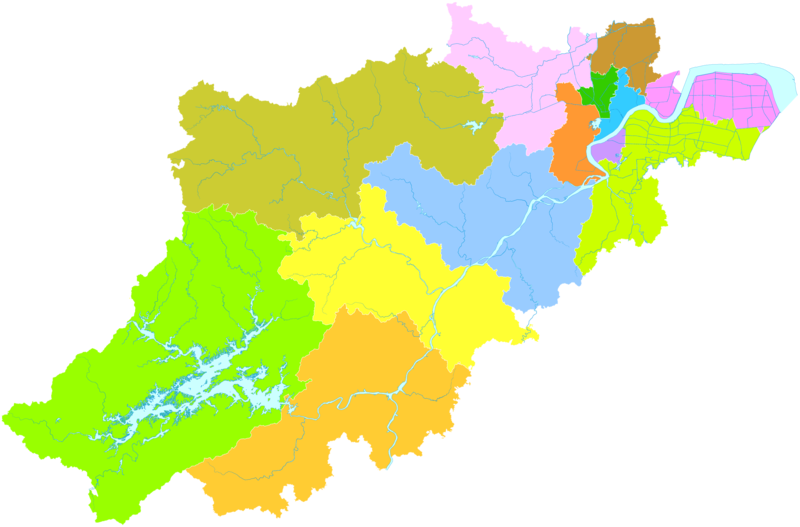 However, Wu Chinese varies throughout the area where it is spoken, hence, Hangzhou's dialect differs from regions in southern Zhejiang and southern Jiangsu. As the official language defined by China's central government, Mandarin is the dominant spoken language. Hangzhou's local cuisine is often considered to be representative of Zhejiang provincial cuisine, which is claimed as one of China's eight fundamental cuisines. The locally accepted consensus among Hangzhou's natives defines dishes prepared in this style to be "fresh, tender, soft, and smooth, with a mellow fragrance." Generally, Hangzhou's cuisines tend to be sweeter rather than savoury. Owing to the fact that Hangzhou is located near the Yangtze river, where the climate is mild, the local people enjoy a light diet incorporating river fishes. The rich history of the city provides the local people with stories revolving the origins of local dishes. Dishes such as Pian Er Chuan Noodles (片儿川), West Lake Vinegar Fish (西湖醋鱼), Dongpo Pork (东坡肉), Longjing Shrimp (龙井虾仁), Beggar's Chicken (叫化鸡), Steamed Rice and Pork Wrapped by Lotus Leaves(荷叶粉蒸肉), Braised Bamboo Shoots (油焖笋), Lotus Root Pudding (藕粉) and Sister Song's Fish Soup (宋嫂鱼羹) are some of the better-known examples of Hangzhou's regional cuisine. There are lots of theaters in Hangzhou showing performance of opera shows. Yue opera, originated from Shengzhou, Zhejiang Province, is the second-largest opera form in China. Also, there are several big shows themed with the history and culture of Hangzhou like Impression West Lake and the Romance of Song Dynasty. Hangzhou has historically been an important hub for artists and scholars. In modern times, Hangzhou was home to the China Art Academy and prominent painters such as Lin Fengmian and Fang Ganmin. Tea is an important part of Hangzhou's economy and culture. Hangzhou is best known for originating Longjing, a notable variety of green tea, the most notable type being Xi Hu Long Jing. Known as the best type of Long Jing tea, Xi Hu Long Jing is grown in Longjing village near Xi Hu in Hangzhou, hence its name. The local government of Hangzhou heavily invests in promoting tourism and the arts, with emphasis placed upon silk production, umbrellas, and Chinese hand-held folding fans. The Port of Hangzhou is a small river port with a cargo throughput that exceeds 100 million tons annually. Hangzhou is served by the Hangzhou Xiaoshan International Airport, which provides direct service to many international destinations such as Thailand, Japan, South Korea, Malaysia, Vietnam, Singapore, Taiwan, Netherlands, Qatar, Portugal and the United States. Regional routes reach Hong Kong and Macau. It has an extensive domestic route network within the PRC and is consistently ranked top 10 in passenger traffic among Chinese airports. Hangzhou Xiaoshan International Airport has two terminals, Terminal A and Terminal B. The smaller Terminal A serves all international and regional flights while the larger Terminal B solely handles domestic traffic. The airport is located just outside the city in the Xiaoshan District with direct bus service linking the airport with Downtown Hangzhou. The ambitious expansion project will see the addition of a second runway and a third terminal which will dramatically increase capacity of the fast-growing airport that serves as a secondary hub of Air China. A new elevated airport express highway is under construction on top of the existing highway between the airport and downtown Hangzhou. The second phase of Hangzhou Metro Line 1 has a planned extension to the airport. Hangzhou sits on the intersecting point of some of the busiest rail corridors in China. The city's main station is Hangzhou East railway station (colloquially "East Station" 东站). It is one of the biggest rail traffic hubs in China, consisting of 15 platforms that house the High Speed CRH service to Shanghai, Nanjing, Changsha, Ningbo, and beyond. The subway station beneath the rail complex building is a stop along the Hangzhou Metro Line 1 and Line 4. There are frequent departures for Shanghai with approximately 20-minute headways from 6:00 to 21:00. Non-stop CRH high-speed service between Hangzhou and Shanghai takes 50 minutes and leaves every hour (excluding a few early morning/late night departures) from both directions. Other CRH high-speed trains that stop at one or more stations along the route complete the trip in 59 to 75 minutes. Most other major cities in China can also be reached by direct train service from Hangzhou. The Hangzhou railway station (colloquially the "City Station" Chinese: 城站) was closed for renovation in mid 2013 but has recently opened again. Direct trains link Hangzhou with more than 50 main cities, including 12 daily services to Beijing and more than 100 daily services to Shanghai; they reach as far as Ürümqi. The China Railway High-Speed service inaugurated on October 26, 2010. The service is operated by the CRH 380A(L), CRH 380B(L) and CRH380CL train sets which travel at a maximum speed of 350 km/h (220 mph), shortening the duration of the 202 km (126 mi) trip to only 45 minutes. Central (to the east of the city centre, taking the place of the former east station), north, south, and west long-distance bus stations offer frequent coach service to nearby cities/towns within Zhejiang province, as well as surrounding provinces. Hangzhou has an efficient public transportation network, consisting of a modern fleet of regular diesel bus, trolley bus, hybrid diesel-electric bus and taxi. The first metro system line entered into service in late 2012. with major expansion plans still ongoing. It is the 17th city in China to operate a rapid transit system. In 2018, the state council approved the planning for 15 metro lines, including extensions to the three existing lines, scheduled to open in time for the 2022 Asian Games. By then the Hangzhou Metro network is projected to be 617 km (383 mi) long. Hangzhou is known for its extensive Bus Rapid Transit network expanding from downtown to many suburban areas through dedicated bus lanes on some of the busiest streets in the city. Bicycles and electric scooters are very popular, and major streets have dedicated bike lanes throughout the city. Hangzhou has an extensive free public bike rental system, the Hangzhou Public Bicycle system. The Hangzhou Metro began construction in March 2006, and the first line opened on November 24, 2012. Line 1 connects downtown Hangzhou with suburban areas of the city from Xianghu to Wenze Road and Linping. By June 2015, the southeast part of Line 2 (starts in Xiaoshan District, ends to the south of the city centre) and a short part of Line 4 (fewer than 10 stations, connecting Line 1 & Line 2) were completed. The system is expected to have 15 lines upon completion; most lines are still under construction. The extensions of Line 2 (Xihu District) and Line 4 (east of Bingjiang) have been finished in 2018. Taxis are also popular in the city, with the newest line of Hyundai Sonatas and Volkswagen Passats, and tight regulations. In early 2011, 30 electric taxis were deployed in Hangzhou; 15 were Zotye Langyues and the other 15 were Haima Freemas. In April, however, one Zoyte Langyue caught fire, and all of the electric taxis were taken off the roads later that day. The city still intends to have a fleet of 200 electric taxis by the end of 2011. In 2014, a large number of new electric taxis produced by Xihu-BYD (Xihu (westlake) is a local company which produced televisions in the past) were deployed. Hangzhou has a large student population with many higher education institutions based in the city. Public universities include Zhejiang University, Zhejiang University of Technology, and Hangzhou Normal University etc. Xiasha, located near the east end of the city, and Xiaoheshan, located near the west end of the city, are college towns with a cluster of several universities and colleges. Hangzhou International School, Wellington College International Hangzhou and Hangzhou Japanese School (杭州日本人学校) (nihonjin gakkō) serve the local expat population in Hangzhou. Fishers, Indiana, in the United States, is in the exploration process of becoming sister cities with Hangzhou. A typical Chinese garden's window in Hangzhou. It is a common technique for the view to resemble a Chinese painting. This phrase has a similar meaning to the English phrases "Heaven on Earth". Marco Polo in his accounts described Suzhou as "the city of the earth" while Hangzhou is "the city of heaven". The city presented itself as "Paradise on Earth" during the G20 summit held in the city in 2016. The meaning here lies in the fact that Suzhou was renowned for its beautiful and highly civilized and educated citizens, Hangzhou for its scenery, Guangzhou for its food, and Liuzhou (of Guangxi) for its wooden coffins which supposedly halted the decay of the body (likely made from the camphor tree). Jack Ma: Co-founder and executive chairman of the Alibaba Group. Zong Qinghou: Entrepreneur, founder, Chairman and CEO of the Hangzhou Wahaha Group. Sun Yang: Olympic gold medalist and competitive swimmer. Ye Shiwen: Olympic gold medalist and competitive swimmer. Wu Yibing: World No.1 in the ITF juniors ranking and professional tennis player. ^ For a discussion of the many sources and variant spellings of the names, see Moule. The ultimate Chinese source of these names has been variously given as Jīngshī (京師, "the Capital"); Xingzai, an abbreviated form of Xíngzàisuǒ (行在所, "the Place of Temporary Residence"), which had formerly been an byname for the Song capital from the hope that the court would eventually return north to Kaifeng; and Hangtsei, the Hangzhounese pronunciation of the town's name. ^ a b c d e Economic and Social Development Report of Hangzhou Metropolitan Circles (2007–2012) (in Chinese). Social Sciences Academic Press(China). October 1, 2012. Archived from the original on May 12, 2013. Retrieved February 20, 2013. ^ "Illuminating China's Provinces, Municipalities and Autonomous Region". PRC Central Government Official Website. 2001. Archived from the original on March 11, 2014. Retrieved April 22, 2014. ^ "Chinese Cities of Opportunities 2018 Report". PricewaterhouseCoopers. Retrieved December 29, 2018. ^ "The World According to GaWC 2018". Globalization and World Cities Research Network. Loughborough University. November 14, 2018. Archived from the original on December 1, 2018. Retrieved November 14, 2018. ^ 2012中国都市圈评价指数今年7月发布 (in Chinese). Shanghai Jiaotong University. July 2, 2012. Archived from the original on February 28, 2013. Retrieved February 20, 2013. ^ 2015年浙江省1%人口抽样调查主要数据公报-浙江统计信息网. www.zj.stats.gov.cn. Retrieved April 10, 2016. ^ "Hangzhou of China selected to host 2022 Asian Games". Xinhua. September 16, 2015. Archived from the original on November 25, 2015. Retrieved September 16, 2015. ^ "China to host 2016 G20 summit in Hangzhou". PRC Central Government Official Website. 2015. Archived from the original on November 18, 2015. Retrieved December 20, 2015. ^ Yan Wenming. "The Beginning of Farming", p. 36, in The Formation of Chinese Civilization: An Archaeological Perspective, pp. 27–42. Yale University Press (New Haven), 2005. ISBN 978-0-300-09382-7. ^ Fuller, Dorian; et al. (2009). "The Domestication Process and Domestication Rate in Rice: Spikelet bases from the Lower Yangtze" (PDF). Science. 323: 1607–1610. doi:10.1126/science.1166605. PMID 19299619. Archived (PDF) from the original on September 22, 2017. Retrieved April 20, 2018. ^ Shanghai Qingpu Museum. "[museum.shqp.gov.cn/gb/content/2009-02/23/content_237435.htm Migration of the Tribe and Integration into the Han Chinese]". Accessed 24 July 2014. ^ Zhongguo lishi diming dacidian 中國歷史地名大詞典, (Shanghai: Shanghai cishu chubanshe): 1516. ^ Ebrey, Cambridge Illustrated History of China, 114: "[…] the Grand Canal, dug between 605 and 609 by means of enormous levies of conscripted labour." ^ Zhou Feng (周峰) (1997). 吴越首府杭州: 及北宋东南第一州 (in Chinese). University of California: 浙江人民出版社 [Zhejiang People's Press]. p. 32. Retrieved July 22, 2014. ^ Worthy 1983, p. 19. ^ Barmé, Germeie R. (2012), "Glossary: Tides Chao 潮", China Heritage Quarterly, No. 29, Australian National University College of Asia & the Pacific . ^ Piper Rae Gaubatz (1996). Beyond the Great Wall: urban form and transformation on the Chinese frontiers (illustrated ed.). Stanford University Press. p. 210. ISBN 0-8047-2399-0. Retrieved July 17, 2011. ^ Greville Stewart Parker Freeman-Grenville, Stuart C. Munro-Hay (2006). Islam: an illustrated history (illustrated, revised ed.). Continuum International Publishing Group. p. 228. ISBN 0-8264-1837-6. Retrieved July 17, 2011. ^ Zhongguo guo ji mao yi cu jin wei yuan hui (1991). China's foreign trade. the University of California: China Council for the Promotion of International Trade. p. 98. Retrieved July 17, 2011. ^ Elliott, Michael (July 21, 2011). "Summer Journey 2011". Archived from the original on January 17, 2012. Retrieved October 28, 2011 – via www.time.com. ^ Coblin, Weldon South (2002). "Migration History and Dialect Development in the Lower Yangtze Watershed". Bulletin of the School of Oriental and African Studies. 65 (3): 533. doi:10.1017/s0041977x02000320. ^ Holcombe, Charles (2011). A History of East Asia: From the Origins of Civilization to the Twenty-First Century. Cambridge University Press. p. 129. ISBN 978-0-521-51595-5. ^ a b Mote, Frederick W. (2003). Imperial China: 900–1800. Harvard University Press. pp. 292–3. ISBN 978-0-674-01212-7. ^ Franke, Herbert (1994). Denis C. Twitchett; Herbert Franke; John King Fairbank (eds.). The Cambridge History of China: Volume 6, Alien Regimes and Border States, 710–1368. Cambridge University Press. p. 229. ISBN 978-0-521-24331-5. ^ a b Mote, Frederick W. (2003). Imperial China: 900–1800. Harvard University Press. p. 461. ISBN 978-0-674-01212-7. ^ Gernet, Jacques (1962). Daily Life in China, on the Eve of the Mongol Invasion, 1250–1276. Stanford University Press. p. 25. ISBN 978-0-8047-0720-6. ^ Yuhang Cultural Network (October 2003). Shen Kuo's Tomb Archived May 2, 2014, at the Wayback Machine The Yuhang District of Hangzhou Cultural Broadcasting Press and Publications Bureau. Retrieved on 2007-05-06. ^ "Largest Cities Through History". Geography.about.com. March 2, 2011. Archived from the original on February 18, 2001. Retrieved March 16, 2011. ^ a b Moule (1957), p. 4. ^ Moule, Arthur Christopher (1957), Quinsai, Cambridge: Cambridge University Press, pp. 2–4 . ^ Diana Childress. Marco Polo's Journey to China. ISBN 9781467703796. ^ Elliott, Michael (July 21, 2011). "The Enduring Message of Hangzhou". Time.com. Archived from the original on January 17, 2012. Retrieved November 5, 2011. ^ Battutah, Ibn (2002). The Travels of Ibn Battutah. London: Picador. pp. 268, 323. ISBN 9780330418799. ^ Cassel, Pär (2003), "Excavating Extraterritoriality: The "Judicial Sub-Prefect" as a Prototype for the Mixed Court in Shanghai", Late Imperial China, Vol. 24, No. 2, pp. 156–182 . ^ Hangzhou Archived August 26, 2006, at the Wayback Machine. China Today. Retrieved August 22, 2006. ^ "Extreme Temperatures Around the World". Archived from the original on August 6, 2014. Retrieved February 21, 2013. ^ "Hangzhou". China Meteorological Data Sharing Service System. December 2013. Archived from the original on March 18, 2013. Retrieved January 1, 2014. ^ "China: Provinces and Major Cities - Population Statistics, Maps, Charts, Weather and Web Information". www.citypopulation.de. Archived from the original on December 9, 2017. Retrieved December 8, 2017. ^ "The World's Cities in 2016" (PDF). United Nations. 2016. p. 11. Archived (PDF) from the original on October 1, 2017. Retrieved December 8, 2017. ^ "Demographia World Urban Areas, 13th Annual Edition" (PDF). April 2017. Archived from the original (PDF) on November 26, 2017. ^ "Hángzhōu Shì (Sub-provincial City, China) - Population Statistics, Charts, Map and Location". www.citypopulation.de. Archived from the original on December 9, 2017. Retrieved December 8, 2017. ^ "Major Agglomerations of the World - Population Statistics and Maps". www.citypopulation.de. Archived from the original on December 9, 2017. Retrieved December 8, 2017. ^ "Hangzhou City Profile 2017" (PDF). Jones Lang LaSalle IP, Inc. 2017. Archived (PDF) from the original on December 9, 2017. Retrieved December 8, 2017. ^ a b "Industries of Hangzhou". Hzindus.gov.cn. Archived from the original on July 7, 2011. Retrieved March 16, 2011. ^ "Hangzhou Economy". China-window.com. Archived from the original on January 8, 2009. Retrieved March 16, 2011. ^ Hangzhou Economic & Technological Development Zone|China Industrial Space Archived March 23, 2010, at the Wayback Machine. Rightsite.asia. Retrieved on 2011-08-28. ^ Hangzhou Export Processing Zone|China Industrial Space Archived April 17, 2010, at the Wayback Machine. Rightsite.asia (2000-04-27). Retrieved on 2011-08-28. ^ Hangzhou Hi-Tech Industrial Development Zone|China Industrial Space Archived March 22, 2010, at the Wayback Machine. Rightsite.asia. Retrieved on 2011-08-28. ^ "Hangzhou Development Zones". China Briefing. Archived from the original on May 7, 2015. Retrieved May 9, 2015. ^ a b "the tea fields of Longjing". Minor Sights. Retrieved December 9, 2015. ^ "Modern-Day Marco Polo for Hangzhou, China". NBC NEWS. Archived from the original on December 5, 2014. Retrieved November 26, 2014. ^ "Briton appointed by Chinese government to promote the country on Facebook (but locals are still banned from the site)". Daily Mail. May 21, 2014. Archived from the original on December 6, 2014. Retrieved November 26, 2014. ^ "杭州灵隐寺清明礼祖 祭扫弘一法师舍利塔墓-大陆教界内容-佛教在线". www.fjnet.com. Archived from the original on April 27, 2018. Retrieved April 26, 2018. ^ Samuel Wells Williams (1848). The Middle kingdom: a survey of the ... Chinese empire and its inhabitants ... (3 ed.). Wiley & Putnam. p. 98. Retrieved May 8, 2011. ^ The Chinese repository, Volume 13. Printed for the proprietors. 1844. p. 32. Retrieved May 8, 2011. ^ "The Lost Jews of Kaifeng". Jewish-holiday.com. Archived from the original on July 13, 2011. Retrieved March 16, 2011. ^ Walter Macon Lowrie, Presbyterian church in the U.S.A. Board of foreign missions (1854). Memoirs of the Rev. Walter M. Lowrie: missionary to China. Presbyterian board of publication. p. 256. Retrieved July 17, 2011. ^ Fan, Maureen (October 1, 2006). "In China, Churches Challenge the Rules". Washington Post. Archived from the original on October 18, 2017. Retrieved November 1, 2017. ^ Cummings, Joe and Robert Storey (1991). China, Volume 10. Lonely Planets Publications. p. 345. ISBN 0-86442-123-0. ^ "Hangzhou Port cargo throughput exceeds 100 mln tons". Hangzhou Weekly. October 26, 2016. Archived from the original on January 1, 2015. Retrieved December 29, 2014. ^ KLM launched its first flight to Hangzhou in China Archived October 9, 2011, at the Wayback Machine. Schiphol (2010-05-08). Retrieved on 2011-08-28. ^ xinhuanet (October 26, 2010). "China unveils Shanghai-Hangzhou high-speed railway; eyes network extension". Archived from the original on October 29, 2010. Retrieved October 26, 2010. ^ "Hangzhou Halts All Electric Taxis as a Zotye Langyue (Multipla) EV Catches Fire". ChinaAutoWeb. Archived from the original on June 18, 2011. Retrieved July 6, 2011. ^ "Introducing ZISU". zisu.edu. Archived from the original on March 13, 2014. Retrieved March 12, 2014. ^ "Zhejiang University surpasses Tsinghua as top university of China". China.org.cn. Archived from the original on April 1, 2014. Retrieved November 17, 2014. ^ home page. Wellington College International Hangzhou. ^ home page Archived August 16, 2018, at the Wayback Machine. Hangzhou Japanese School. ^ Baguio City, as a highly urbanized city, is directly administered. ^ Budapest constitutes its own county. ^ "Kota Kinabalu, Hangzhou to ink MoU to enhance friendship ties". The Borneo Post. November 12, 2016. Archived from the original on March 16, 2017. Retrieved March 17, 2017. ^ "Remarks by Consul-General CHEN Peijie At the National Day Reception". Consulate General of the People's Republic of China in Kota Kinabalu. September 23, 2016. Archived from the original on March 16, 2017. Retrieved March 17, 2017. ^ Hannah Beech (September 2, 2016). "China's Hanghzou Clears Out Pests—and People—as It Prepares to Host the G20 Summit". Archived from the original on October 17, 2016. Retrieved October 16, 2016. This article incorporates text from The Middle kingdom: a survey of the ... Chinese empire and its inhabitants ..., by Samuel Wells Williams, a publication from 1848 now in the public domain in the United States. This article incorporates text from The middle kingdom: a survey of the geography, government, education, social life, arts, religion, etc. of the Chinese empire and its inhabitants, Volume 2, by Samuel Wells Williams, John William Orr, a publication from 1848 now in the public domain in the United States. This article incorporates text from The Baptist missionary magazine, Volume 29, by American Baptist Missionary Union. Executive Committee, Baptist General Convention. Board of Managers, a publication from 1849 now in the public domain in the United States. This article incorporates text from My holidays in China: An account of three houseboat tours, from Shanghai to Hangehow and back via Ningpo; from Shanghai to Le Yang via Soochow and the Tah Hu; and from Kiukiang to Wuhu; with twenty-six illustrations (from photographs), by William R. Kahler, a publication from 1895 now in the public domain in the United States. This article incorporates text from Reports from the consuls of the United States, Issues 124–127, by United States. Bureau of Foreign Commerce, a publication from 1891 now in the public domain in the United States. This article incorporates text from Memoirs of the Rev. Walter M. Lowrie: missionary to China, by Walter Macon Lowrie, Presbyterian church in the U.S.A. Board of foreign missions, a publication from 1854 now in the public domain in the United States. This article incorporates text from Darkness in the flowery land: or, Religious notions and popular superstitions in north China, by Michael Simpson Culbertson, a publication from 1857 now in the public domain in the United States. Cotterell, Arthur (2007). The Imperial Capitals of China – An Inside View of the Celestial Empire. London: Pimlico. p. 304. ISBN 978-1-84595-009-5. Gernet, Jacques (1962). Daily Life in China on the Eve of the Mongol Invasion, 1250–1276. Stanford: Stanford University Press. ISBN 0-8047-0720-0. Wikisource has the text of the 1905 New International Encyclopedia article Hang-chow.